Monday, October 02, 2017 - Dubai, UAE - StarLink, the region’s “True” Value-Added-Distributor (VAD), today announced that it will join forces with Citrix in the Middle East, Egypt and Libya. 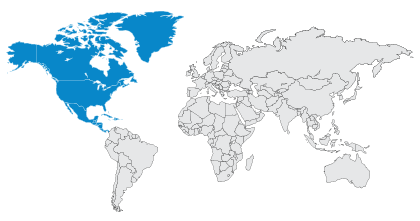 As a trusted advisor for Citrix, StarLink will provide value-added distribution services, including managing Citrix channel partner relationships, enhancing sales for Citrix products, and delivering technical support to the channel community in the region. With a fully dedicated business unit for Citrix distribution, StarLink will help increase reseller expertise in Citrix solutions for desktop virtualization, cloud networking, cloud platform, collaboration and data sharing. 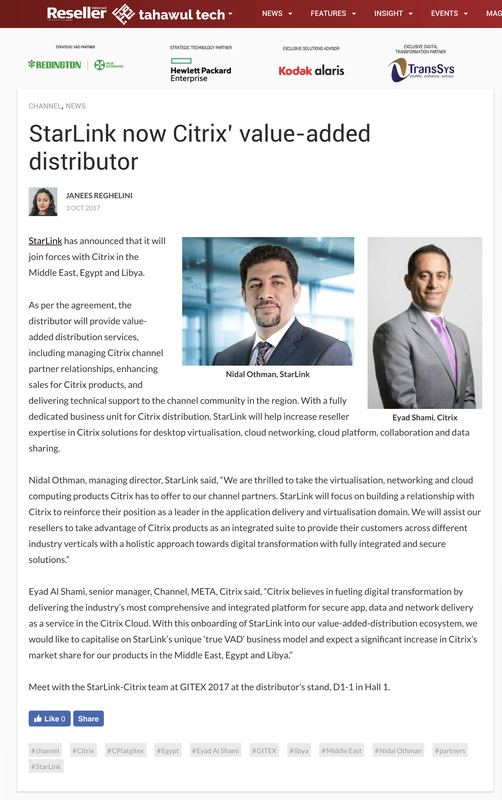 Nidal Othman, Managing Director at StarLink said, "We are thrilled to take the virtualization, networking and cloud computing products Citrix has to offer to our channel partners. StarLink will focus on building a relationship with Citrix to reinforce their position as a leader in the application delivery and virtualization domain. We will assist our resellers to take advantage of Citrix products as an integrated suite to provide their customers across different industry verticals with a holistic approach towards digital transformation with fully integrated and secure solutions. Eyad Al Shami, Sr. Manager, Channel – META at Citrix said, “Citrix believes in fueling digital transformation by delivering the industry’s most comprehensive and integrated platform for secure app, data and network delivery as a service in the Citrix Cloud. 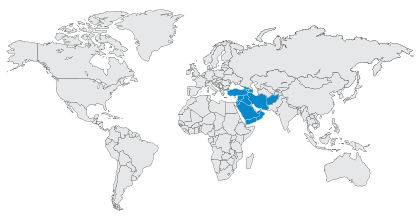 With this onboarding of StarLink into our value-added-distribution ecosystem, we would like to capitalize on StarLink’s unique “True VAD” business model and expect a significant increase in Citrix’s market-share for our products in the Middle East, Egypt and Libya." Meet with the StarLink-Citrix team at GITEX 2017 at the StarLink Stand D1-1, Hall 1 Entrance. StarLink is acclaimed as the fastest growing “True” Value-added Distributor across the Middle East, Turkey and Africa regions with on-the-ground presence in 11 countries including UK and USA. With its innovate Security Framework, StarLink is recognized as a "Trusted Security Advisor” to over 2000 plus enterprise and government customers that use one or more of StarLink’s best-of-breed and market-leading technologies, sold through its Channel network of over 770 Partners. The StarLink Solution Lifecycle helps Channel Partners differentiate offerings, and assists customers to identify key risks and define priorities for addressing IT Security gaps relating to compliance and next-generation threat protection.